Background: Rupture of fetal membranes can occur at any gestational age. Premature rupture of membranes (PROM) means rupture of fetal membranes before the onset of labor. 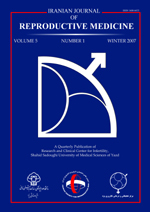 Objective: The purpose of this study was to evaluate and compare the reliability of the vaginal washing fluid urea and creatinine for the diagnosis of PROM and to determine cut-off values. Materials and Methods: A total of 179 pregnant women were recruited. All patients underwent different examinations. These included nitrazine paper test, fern test, amniotic fluid pooling, vaginal washing fluid urea and creatinine sampling. The one group consisted of 126 pregnant women between 14 and 41 weeks of gestation with the complaint of vaginal fluid leakage. Patients who had positive pooling, nitrazine paper test and fern test were considered as confirmed PROM group (group 1). On the other side, patients with pooling (-) and/or nitrazine paper test (-) and/or fern test (-) were taken as suspected unconfirmed PROM cases (group 2). The control group consisted of 53 pregnant women between 14 and 41 weeks of gestation without any complaint or complication. We conducted one-way ANOVA test on the urea and creatinine measures and post-hoc comparison test. Cut-off value was determined by receiver operating characteristic (ROC) curve. Results: Vaginal fluid concentrations of urea and creatinine were significantly different between the three groups (p<0.001). The sensitivity, specificity, positive and negative predictive values and accuracy were all 100% in detecting premature rupture of membranes by evaluation of vaginal fluid creatinine concentration with a cut-off value of 0.45 mg/dl, respectively. Conclusion: This study demonstrates that of two markers investigated creatinine has the higher diagnostic power. Premature rupture of membranes, Creatinine, Urea, Vaginal washing fluid.